your lean muscle building and fat loss efforts! As low as $30 plus free shipping! Are You Afraid To Eat Fish? It seems every time you put on the news there's another story warning you about the dangers of eating too much fish due to high levels of heavy metals and impurities. "Don't eat tuna", "Eat only farm-raised fish", "Mercury poisoning possible in just 1-2 servings a week"...the stories are endless. It doesn't get much better in supposed "health food" stores where shelves are stacked with cheap versions of omega-3's that famous author Dr. Barry Sears refers to as the "Sewer of the Sea"! Stop trusting your health and virtually every cellular function in your body to substandard sources of omega-3's. Remember... you cannot synthesize these essential fatty acids on your own... you absolutely need to find a reliable source to get them from if you're going to optimize your health! They're called ESSENTIAL for very good reason! Pharmaceutical grade Omega-3’s… The secret Weapon you’ve been waiting for to end the ‘Inflammation War” your body is losing everyday! Don't Let Your Hard Work In the Gym Go Unrewarded... Do you ever feel like you're in a constant war with your body? You fight to get rid of fat, but your body just keeps putting it on! You work out five, six or even seven days a week but yet... seem like you've hit a plateau and can't put on even an ounce of new muscle. What's the problem? Simple. You're losing the "Inflammation War" raging inside your body on a daily basis. When you workout you cause a mechanical break down of muscle tissue and muscle fiber micro-damage/inflammation. While this is a desired and necessary stimulus from which muscle regeneration and growth can occur... left uncontrolled, your body finds it nearly impossible to recover prior to the next workout and you wind up quickly descending into a vicious cycle of inflammatory overtraining. Simple math states that when you break down muscle cells faster than you can repair them... YOU DON'T GET RESULTS! Dr. C’s Contains an Astounding 1080 EPA/720 DHA Concentration of Pharmaceutical Grade EFA’s Per Recommended Daily Dose! 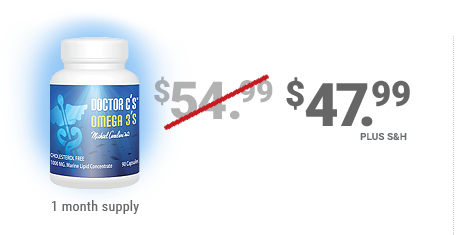 Dr. C's Omega 3's Allow You To FINALLY Experience The FULL Benefits This Irreplaceable Supplement Has to Offer (Especially For Those Who THOUGHT Their Health Food Store Bought Omega's Were Actually Working!) Omega-3's are nothing new. Doctors, scientists, and other health and fitness experts have been raving about their amazing health benefits for years. But unless you were willing to pay hundreds of dollars a month and get a prescription from a doctor for a pharmaceutical version, it was almost impossible to find the pure, molecularly distilled high-grade concentrations of Omega-3's that they were talking about all along. This meant regular people who could only afford the "knock off" brands at their local health store only got a fraction of the benefits (and frankly wasted a lot of their money in the process). Now, thanks to a brand new fish oil purification process we are bringing you the same high dose concentrations of Omega-3's previously only available to people with the means to pay exorbitant prices – at a cost that now anyone can afford! Now don't be confused. 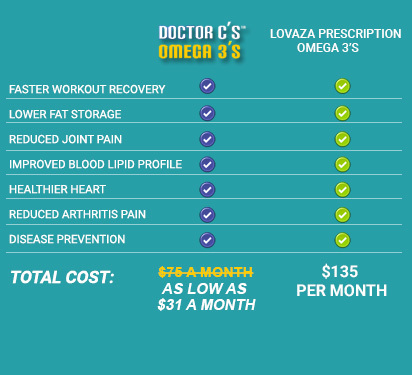 Dr. C's Omega 3's cannot be purchased for $8 a bottle in a grocery store... and for good reason! When it comes to getting the benefits of Omega-3 essential fatty acids, it's quite simply a case of "you get what you pay for". The fact is that by removing the toxins, heavy metals and impurities that are found in bulk in most store bought brands... the remaining fatty acids (DHA and EPA) become more concentrated and can exert their powerful effects much more effectively and efficiently than their imitators. Consider this. It takes about 100 gallons of what you find in the health food stores in your neighborhood or at various sites online to get a gallon of the effective ingredients that actually cause the changes in your body! This is because health food store bought fish oils come from crude fish oil sources... which have been called by the foremost researchers as the sewer of the sea. 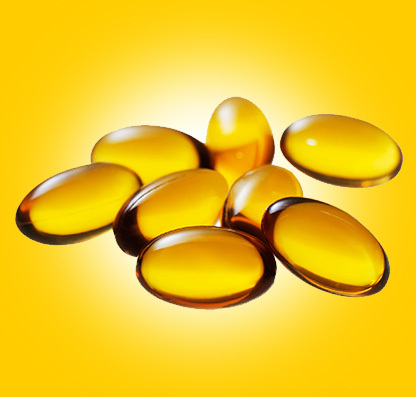 When these fish oils are produced, they are extracted out of the fish, and all the toxins that are fat soluble (like the PCBs, the mercury, and contaminants) go with the oil and become highly concentrated in that oil. Taken consistently, this means more harm than good for those getting their Omega's from these inferior sources. Now, with Dr. C's... you can get your essential fatty acids (that again, MUST be supplied as they cannot be made by the body) in a highly concentrated form without the impurities! 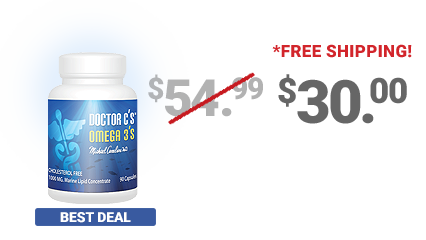 Not sure yet if Dr. C’s Omega 3’s are truly going to make the difference for you as they have for so many others, then get started today with your 1 month supply at a special value of just $47! 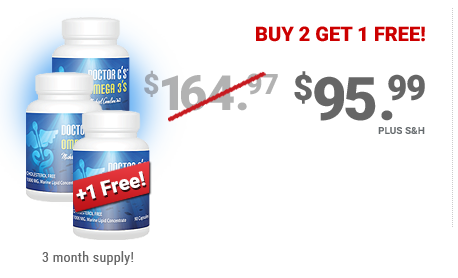 Think about it… Would you invest $1.50 a day to significantly reduce joint aches and pains, accelerate your recovery from tough workouts, and elevate your mood… all while shielding your heart from the damaging effects of heart disease and high cholesterol? Now you can with this “try me size” of this high grade Omega-3! With over 87% of people being chronically deficient in high-grade Omega-3 essential fatty acids, it’s no wonder that within days of starting to take Dr. C’s, they begin to experience significant boosts in overall energy levels, metabolism, focus, and productivity working out. That said, it’s no surprise that once you do, you’re going to want to reorder more of what some have called the closest thing to a “scientifically proven fountain of youth”! Get a head start and save BIG by investing in a 3-month supply now… and pay for just 2. THAT’S 1 MONTH COMPLETELY FREE! Choose ‘custom Auto ship’ & save big! Cancel at anytime without risk. Save $17 savings per month Plus *free shipping!